Stop Comparing Yourself To Others | They Are Not You! Introduction: Why Do We Compare? Ever wonder how to stop comparing yourself to others? We do it because it is easy to do. It seems that humans are somehow hardwired to look at their own lives and then look at the lives of others, and start comparing and contrasting the two. That doesn’t mean this is a healthy process. Do you ever catch yourself making one or more of the following statements? We do it all the time, don’t we? Stop comparing yourself to others. It seems to be some type of built-in self-punishment tool that we whip ourselves with over and over. In a way, this is a part of the survival instinct every human being is born with. Back when your cave-dwelling ancestors were ecstatic if they had anything to eat every couple of days, the food was very important. Imagine that there were a couple of friendly Paleolithic tribes located right next to each other. One of the tribes had excellent hunters. It seemed they were always eating brontosaurus burgers and saber-toothed tiger ribs, or something crazy, while the second tribe was lucky to eat at all. If this situation continued for any serious amount of time, the first tribe would thrive, reproduce and grow, while the second tribe would probably fade into oblivion. So it would have made sense for the hungry tribe to compare itself to its neighbors. When the hungry cavemen saw that the other tribe was so good at hunting, that might make the tribesmen in the starving group work harder at their hunting skills. They may go next door to their well-eating neighbors and ask for some tips about hunting. Their survival instinct told them that if they did not get better at hunting, they would not be around very long. So they compared their poor abilities to the considerable hunting talents of their next-door neighbors, in order to get better at this life-saving skill. Today we don’t need to do this. Comparing ourselves to others doesn’t present a live-or-die set of results, in most cases. Despite some scary statistics you will see in a moment, most people have a roof over their heads, food to eat, water to drink and the ability to regulate the temperature in their homes. Because of this, humans have started comparing themselves to others in ways that really don’t matter. You wish you were taller, like your friend. You hate that you can seemingly never lose weight, while you know someone who can eat just about anything and always look slim and trim. You compare your car, your home, your bank account and sometimes even the members of your family to those components in someone else’s life. This is never a good idea because it can create frustration, low self-esteem, and a mentality where you settle for your current lot in life because maybe you have it better than somebody else. Stop worrying about your neighbor, the wealthy Internet guru you saw online or the gorgeous celebrity who seems to have it all. Truth be told, those people would be jealous of you in a lot of ways, and it makes no sense to compare yourself to them anyway. Creating a sense of the true value and worth of your life, as opposed to trying to keep up with the Joneses, begins with practicing gratitude. It’s okay to want more than you currently have. This is how human beings drive themselves. When you practice gratitude and are thankful for your blessings, this doesn’t mean you should stop working to be the best “you” that you can possibly be. If the greatest engineers, scientists, doctors, professors and geniuses of the day all stopped working because they were happy to be smarter than most, we may still be living in the electricity-free caves of our ancestors mentioned earlier. Practicing gratitude simply means acknowledging the good things in your life right now. You cannot control the future. It is good to plan for the future and make preparations that increase the odds that your life will be the way you want it to. However, you have no control even over just one second from now. You also cannot control the past. It is what it is. The past is gone, and the future is not yet here. Literally, the only thing that makes up your entire existence as far as time is concerned is this present moment. Instead of living to chase some achievement, embrace your “now”. Research tells us that those people who are fully aware of their present moment live longer than men and women who are plowing through life worried about tomorrow. This is in part because when you are fully aware of this present moment in time, you automatically become appreciative. A mindful awareness of right now means that you see, hear and experience what is going on around you this instant, not yesterday, not tomorrow, not one hour from now. All of your senses are attuned to your current existence. This makes it easy to see the blessings that you have been given. Instead of thinking, “I can’t wait for that be Christmas bonus,” you say, “I am grateful for this job.” This living in the moment awareness makes you thankful that you don’t have everything your heart desires. If you did, what would there be to look forward to in life? Those that are mindfully aware of the present moment have shown dramatically lower stress levels than people caught up in the rat race. You are aware of your breath right now. You are aware of where you are sitting or standing, how you feel, and what your 5 senses are experiencing, right now. When you focus on the present moment, you become instantly grateful for existing, in whatever current state you inhabit. Here are a few ways to express gratitude in your life. Practice them frequently and stop comparing yourself to others, and you will find acceptance and growth, as well as less stress and more peace with who you are. Say “thank you” for each new challenge you receive, because this gives you a chance to be the best you can possibly be. Take a moment right now and look around you. What are you grateful for? You no doubt will see several things that you should be thankful for, no matter how big or small. Be thankful for your mistakes, because that means you are just one more failure away from what you are trying to achieve. Don’t forget to be thankful for the small things. Your shoes may be old and worn. They are better than no shoes at all. Hug the difficult times in your life. These offer opportunities for incredible growth and understanding. Remember there will always be someone who has more than you. Be grateful that person exists, as a lesson to you of what is possible. Practice gratitude for your limitations, because, with practice, they become skills. Spend a few minutes in nature every day, and you can’t help but be amazed at and grateful for the experience. Call a good friend and give them a heartfelt and meaningful thank you. This simple act practiced daily can impact your life positively in so many ways. Remember, anyone can be thankful for the good things in life. Begin embracing what first may appear as challenges or failures, and be grateful for the opportunity to experience them. Think back to the happiest times of your life. You probably had a very positive self-image. Life was good, and you unconsciously believed that you deserved the goodness in your life. The relationship works the other way around as well. If you want to improve your life, improve your self-image. Being grateful and thankful for all of the blessings you have makes you feel good about yourself. You realize that there are so many reasons to be grateful, and your self-esteem is elevated. When you feel good about yourself and happy with who you are, you will find that this attitude also raises how you view your own life and the world around you. Expressing gratitude regularly boosts your self-esteem, which in turn improves your quality of living. The findings are the same in any number of similar experiments on gratitude. It is easy to tell yourself you will be more thankful every day. Life gets busy though. You may not remember to be grateful for each and every experience throughout the day. When you keep a gratitude journal and record your thoughts in the morning, at midday and at night before you go to bed, in just a few days you can see a wealth of things you are grateful for. Complement your friends and family members on something they are good at. This makes you grateful for having that person in your life. Draw up a realistic budget and stick to it. When you begin to see yourself saving money when you had not before, you will be thankful you decided to budget your finances. Notice when you see others gossiping or speaking poorly about someone. Then express gratitude that you are able to be a part of that experience, and you may never gossip again. Schedule quality time with your children doing something they enjoy. There is nothing to be more grateful for than the smile of a child. Embrace the items on your to-do list that you used to despise. Every time you accomplish a task or activity which you really don’t enjoy moves you closer to being able to spend time on the things you relish. Volunteer time with the elderly and infirm. They will be ever grateful for your help, and you become grateful for your own health and independence. It is those types of statistics that can slap you in the face and make you realize just how good you have it. When you see that you are probably better off than most people on the planet, it is easy to practice the gratitude tips mentioned earlier. Most of the time though, it is not a great idea to compare yourself to others. You would probably agree that it doesn’t make much sense to compare a rock to a zebra. How can you compare the two things? They are so totally different that comparison is just silly. The rock is better at being a rock, and the zebra is better at being a zebra, but to compare and contrast one to the other does nothing but waste your valuable time. The same is true for you and anyone else. Earlier we pointed out that it makes a lot of sense to be grateful for having a roof over your head, access to safe drinking water, and food in your belly. Those essentials of life are not guaranteed to anyone. So when you realize how many people struggle in those areas, your comparison of yourself to them makes you incredibly grateful. Unfortunately, people compare themselves to others in ways that don’t make any sense. Men compare their balding hairlines to friends that have a lot of hair. Women look at a pair of shoes on a friend and wish they could afford expensive shoes as well. Some people even compare their children to the children of other parents. This is a fruitless practice, because what does it accomplish really? Let’s say your best friend has a child that goes to school with your kid. They are the same age, the same gender, the same physical size, and may even look a little like. Your friend’s child makes straight A’s, is on the chess team, the debate team and the pep club, and plays three sports. Your child, on the other hand, is physically uncoordinated, works very hard but struggles to get good grades, and has no interest in after-school and intramural activities. The comparison here can only hurt your child. Instead of embracing and loving the characteristics that make your child unique, you can stifle development, damage self-esteem and ruin the relationship you have with your child when you compare him or her to another kid. Give your children the best resources and opportunities to become good people and successful individuals, and stop playing the “nobody wins” comparison game. The same is true when you compare yourself to others. You may as well compare the previously mentioned rock to a zebra because you are so unique that looking at your life and existence in regards to someone else offers no room for comparison. Accordingly, a goal in any area of your life other than finances needs to be specific as well. This allows you to target your actions on a daily, weekly and monthly basis towards a year-end accomplishment. If you desire to make $100,000 this year, you can see that breaks down to just $2,000 a week. Over the course of a week days that becomes $300 a day. Then you can structure your game plan on a daily and weekly basis to attain that much more achievable figure. At each level of your progress, record what happens. No matter what your goal is, in what area of your life, you must track your progress. This allows you to compare you to yourself. You can see whether you are headed in the right direction or not, change your game plan accordingly, and get back on track to creating the reality you want to achieve. 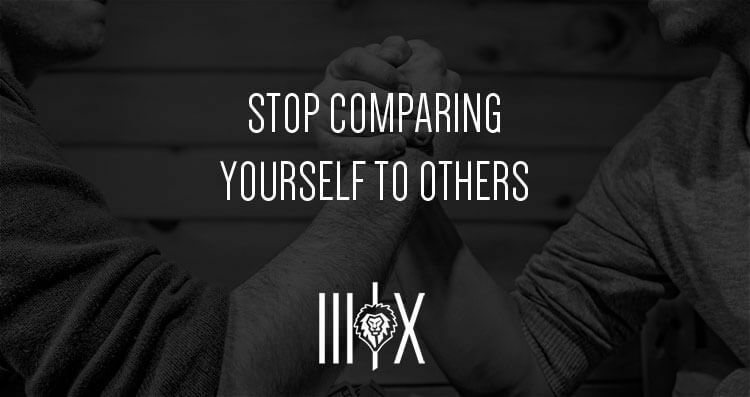 This allows you to compare you against you and no one else, and you will find it produces much better results in your life than comparing yourself to others. A simple way to get yourself to stop playing the comparison game is to develop new thought patterns. This may be difficult to do, especially if you are constantly beginning every one of your thoughts with “I wish …”, “If I only …”, and “If I was like …”. You can stop thinking these damaging and limiting thoughts with the following practices. You look at a person and realize they are better at something than you are. Maybe they have more of an item you desire than you have. This does not make them better than you or make you worse than them. When you start comparing yourself to that person, you resent that individual because they have outperformed you in some way. You also begin to resent yourself, beating yourself up for not being “good enough”. No one wins in that type of game. At first, you may have to consciously remind yourself of this fact. Over time though, if you consistently tell yourself you automatically lose with your comparison to others, you will begin to appreciate the achievements of those people you used to envy, as well as your own skills and characteristics. There is a lot of research that shows how you think about yourself is mirrored by how you think about others. This is true with behavior as well. Those that treat themselves positively also do the same to other people, even strangers. Seemingly random acts of kindness that help others can change your thought patterns away from the pointless comparison, and toward self-realization. If you are grubby, gruff and mean-spirited to others most of the time, this reflects a self-image. Angry, unkind people are often that way because they see the world as mistreating them. The world has been unfair, and they have this belief because they have compared themselves to others and find themselves lacking. They reach out negatively instead of positively, and will always find some comparison to back up their erroneous belief that they deserve to look down on themselves and others. Start smiling more, even if you have to work at it. Help your coworkers. Open your eyes to opportunities to assist others throughout the day. You will find that your attitude towards others will create the way you think about yourself. When you see others as deserving assistance, and kindness and love, you view yourself in that way as well. This means you begin to appreciate the person that you are, rather than desiring to be someone else. There is only one person on the planet you should compare yourself to … you! Look at how much you have grown in so many ways. Look at the areas of opportunity where you still need to grow. Be honest with yourself. You know what you are capable of. Don’t settle for anything less than that. When you succeed, pat yourself on the back. When you fail, be grateful for the ability to recognize this failure is simply an event, not who you are. When you begin to honestly compare yourself to you and no one else, you may start to get excited. You see how truly far you have come as a person, and then you imagine this continued growth in the future. Think about all your accomplishments and you develop an appreciation and love towards yourself that no one can defeat. As mentioned earlier, when you feel good about yourself, you have no need to play the comparison game. You are your own unique person. No one else has your specific skills, brain, body, thoughts, and abilities. Truly no one on the planet is just like you. Since this is the case, it doesn’t make a lot of sense to compare yourself to any other individual. If you are extremely talented in some way, you have a skill or skills that most others don’t. So it wouldn’t make any sense for you to compare yourself to those people. This can lead to you drastically underachieving and not be putting your skills to good use since you see that even a weak attempt makes you better than others in that particular area. You only work hard enough to get by, and you never harness all of your abilities. This happens a lot when you judge and criticize others. It means you view the other human beings on the planet as competition. In competition, you have to be better than your opponent. The easiest way to compare two people in a contest is to call one a winner and another a loser. So by critiquing and criticizing others, even if you believe you are doing it in a positive way, you are unconsciously competing with those people. You judge one as a winner and one as a loser, and if you wind up on the short end of the stick this can lead to the self-regret, low self-esteem and negative comparison results we mentioned earlier. When you judge others you are really judging yourself. Criticize what someone else is wearing, and you probably have some personal issues with your own wardrobe. Instead of elevating that other person you are knocking him or her down. This is what losers and hateful people do because they would rather beat someone else down than work to raise their own experience. Those that are frequently critical of others usually have self-esteem issues. They would rather bring someone down to their own level than help that person reach higher heights. Criticizing and judging others is nothing more than the lazy man’s way to keep from having to make an effort. If you judge that everyone around you is beneath you, your mindset is that you don’t have to do anything, because you are already better than everyone else. Don’t let this happen, because when you criticize others, you are really inwardly criticizing yourself. No one is perfect, especially celebrities and models whose pictures are Photoshopped and edited incessantly before they make it to the Internet. Online, everyone has their best foot forward. When you meet someone on Facebook, Twitter or elsewhere in the virtual world, that person can tell you absolutely anything they desire, true or false. You have no way of understanding whether or not you are being lied to. So when you “meet” people online, you definitely should not play the comparison game. These people could or could not be what they say they are. Their achievements may or may not be as described. Comparison in the real world is senseless, and online even more so. This is why you should limit your social media activity. Aside from the fact that staring at a monitor for hours a day is bad for you in so many ways, you expose yourself to countless opportunities for needless comparison. There is always someone online who is better, smarter, richer, happier and ______er than you. Spending most of your time in a fake, virtual environment full of data and information you can’t verify is an easy way to beat yourself up mentally when you compare yourself to the netizens and media personalities of the World Wide Web. There is no such thing as perfection in the human condition. If you believe that, look at any significant achievement in sports. Just as soon as one record is broken, it falls to the achievement of another individual. Humans were created imperfect, both you and I. It is okay to strive for perfection because that keeps us challenging ourselves in reaching new heights. Just don’t push yourself so hard that you ignore the present moment. Be mindfully aware of who you are and what you have right now. You are the only person like you that has ever existed, will ever exist, or exists right now. Take a second to let that statement sink in. Why in the world when you do such a unique person the disservice of comparing yourself to others when there is no comparison possible? Stop comparing your life, and start living it. After all, it is yours and doesn’t belong to anyone else.